The Association and its chapters, committees, special interest sections, and caucuses provide links to non-AALL websites as a convenience to AALLNET users and for their information. Links are selected based on the quality of information they offer and the relevance and utility of that information to the Association and its members. Links to external websites do not constitute the Association’s endorsement or approval of specific sites, agencies, companies, products, services, institutions, or organizations. The Association is not responsible for the content, arrangement, accuracy, opinions, timeliness, or privacy policies of the linked websites. 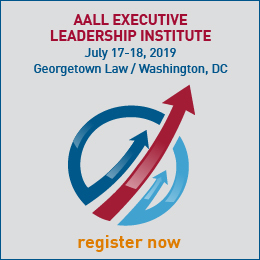 AALL reserves the right to deny a link at any time based on its determination of its own best interests and those of its members. 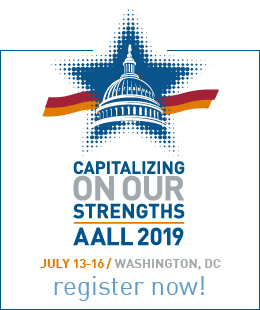 Questions and comments about specific links and suggestions for additional links should be addressed to the AALL Director of Information Technology. The Association welcomes other websites to link to AALLNET, provided that the American Association of Law Libraries is credited as the source. We especially invite law libraries, library and information schools, library associations, and legal community websites to direct users to AALLNET for information about careers in law librarianship.